Making Accountancy Digital - Cheshire Taxation Ltd. Broadly speaking, the plan is to have both Limited Companies and Individuals who are in self-assessment submitting quarterly reports. Quarterly reporting for not only Limited Companies but also all individuals who are within self-assessment. Not just the self-employed and Landlords but all individuals who are currently in self-assessment. When is this due to happen? In typical HM Revenue & Customs style this is due to be phased in over a number of years, but the first year is 2018. So, for some people, the 2017/18 tax return could be their last ever one! 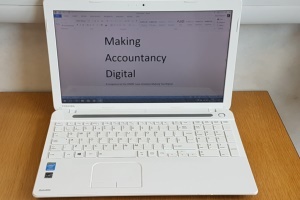 Does “Making Tax Digital” mean that my accountancy fees will go up? No. I have set out my fees below which can be paid on a monthly basis so that I can assist with the new reports. Keep things simple and make my clients’ lives as easy as possible. So, as new software gets released I will review it so that I can make recommendations to my clients and the fees will be set. * This is based on a spreadsheet being used which itemised all your income and expenses. Should I need to do additional book-keeping then I will provide you with a quote during the free initial meeting. ** This quote is based on up to 2 employees who are on a fixed amount per week/month.